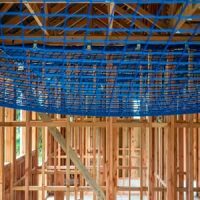 There are many potential hazards when it comes to being on a construction site. 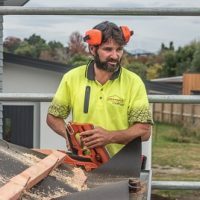 Not only can there be plenty of people on the site doing their bit; builders, roofers, plumbers, electricians and /or council people; there are also things to watch out for such as uneven surfaces to piles of timber, scaffolding levels and house braces. Nigel is very safety conscious when it comes to working on site! He does not like other people around, due to many hazards….not only on the roof, but the whole site. Nigel has battery powered and operated tools (no cords). We work with roofing harnesses when there is no scaffolding or edge protection. 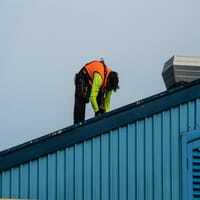 There are nets in place on new roofs, but common sense says do not walk under a roofer while he is on the roof, as nets are not always safe proof. We clean up as we go along, as it saves possible injuries from tripping over, falling over and items hitting you in the head. On a work site…one really needs to watch feet, head and in between. Nigel has a Licensed Building Practitioner (LBP) and is qualified in Working in Heights. He does regular First Aid courses to update his knowledge and skills. 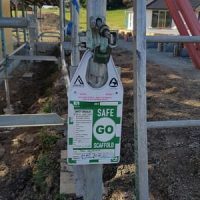 We believe safety is paramount and we are committed to a safe work site. Download our health and safety policy by clicking here. Wearing and using appropriate safety gear will help protect you. When there is no scaffolding involved; wearing a harness can protect your life. Fluro clothing can be seen. 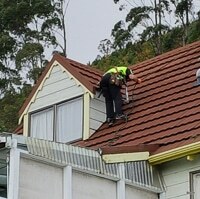 Nets are there to catch items falling from the roof; yet common sense tells not to walk under a roofer on a roof. Can be cheaper than scaffolding for minor repairs or extensions. Not suitable for new roofs. 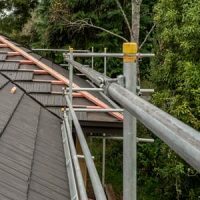 Scaffolding is useful to provide a safe working platform when working on and around roofs.